Here's another recipe from the bestselling novel, Veils and Vengeance. To make the strawberry syrup, first wash and core your strawberries. Toss them in your blender and pulse the mixture. Next, combine the strawberries, lime juice, water, and sugar in a small saucepan. Bring the mixture to a boil, then cook over medium heat for 5 minutes. After removing the pan from the heat, leave the fruit in the syrup while it cools to room temperature. Then, after it cools completely, strain the mixture through a fine mesh sieve into a small pitcher or squeeze bottle. If desired put one scoop of ice cream in the bottom of each bowl. This is how they serve it in Hawaii, with delicious creamy ice cream in the bottom! 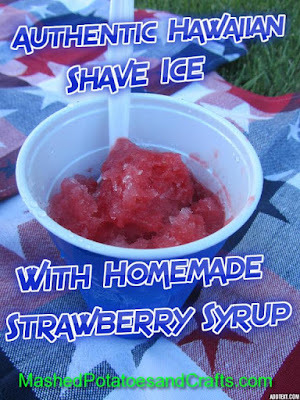 Finely shave ice into bowls or cups, then pour syrup over the ice. My kids loved this treat and we're going to try it with pineapple next! I hope you try this tasty recipe, and if you like it, you might be interested in more projects from my novels about a wedding planner who runs her own craft blog and solves mysteries! These Berry-licious Cupcakes with Magic Glitter would be perfect for a summer party and this tutorial on how to create Coffee-Filter Roses makes beautiful wedding decor. 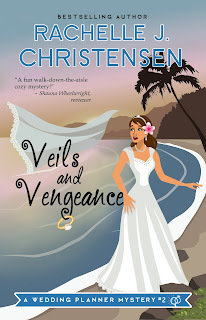 Learn more about Veils and Vengeance and all of the chapter tips, recipes, and tutorials HERE. 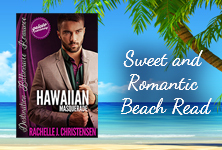 I have a brand new book that is also set in Kauai and features a little Shave Ice too! 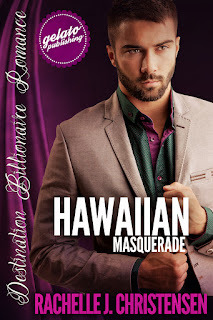 :) You can find Hawaiian Masquerade here and here's a blurb for this sweet new romance!